By the time the middle of next month rolls around, there will likely be a lot of rancor and despair welled up in these 50 states of ours. Most of it will probably be attributable the to the seventh season of AMC’s The Walking Dead, but some of it will probably be election-related. At any rate, we’re going to need a potent and fragrant balm to ease our national pain. And that’s why Space Jam is returning to theaters. Yahoo! 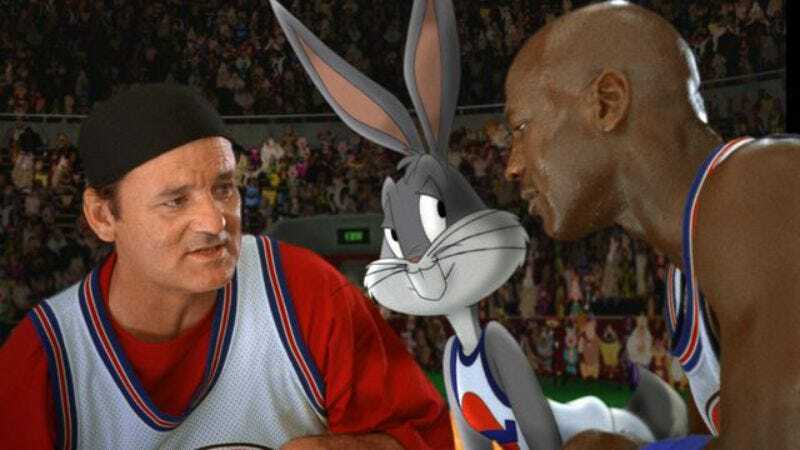 News reports that Michael Jordan, Bill Murray, and Bugs Bunny will be reunited before our wearied, wondering eyes for just two nights next month: Sunday, November 13 and Wednesday, November 16. DGA lifetime achievement award-winning director Joe Pytka’s live-action/animation basketball comedy classic will celebrate the 20-year anniversary of its release on November 15. That’s the ostensible reason for this theatrical resurrection, but it seems pretty obvious that something needed to be done to bring this country together again. If a two-evening run seems an insufficient palliative for America’s sopping wounds, don’t worry. Justin Lin (The Fast And The Furious: Tokyo Drift) and LeBron James (Trainwreck) are already working to bring us a Space Jam sequel that will make President Trump proud.